The FlexiFreeze Ice Vest is the lightest, thinnest, best performing, most cost effective cooling ice vest on the market today. The patented FlexiFreeze Ice Vest uses FlexiFreeze Re-Freezable Ice Sheets to harness the power of 96 pure water ice cubes into 3 ½ pounds of efficient cooling capability. Use over and over again! Just put the FlexiFreeze Ice Sheets in your freezer to recharge. The vest is constructed from neoprene to provide soft, flexible, lightweight insulation. 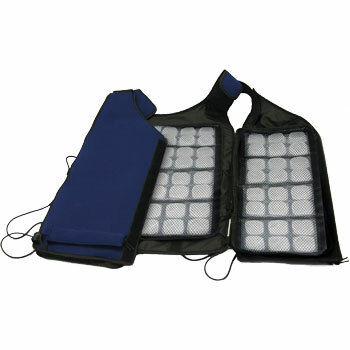 At less than 1" thick, the vest allows for maximum mobility and flexibility. Each vest is outfitted with three re-freezable, removable panels that are attached with Velcro for easy replacement. Adjustable in four places, the FlexiFreeze Ice Vest has been designed to provide a snug fit everyone from XS to 2XX. The vest and panels are machine washable with ice sheets removed. For large quantity purchases, please contact us for pricing and availability.